Initially I thought the first half of season one was too slow paced and kind of boring because I just couldn't figure out the direction of the plot and the main point to the whole story. What happens to the main character just wasn't enough to drive the plot forward in my mind; the "now what? so what?" question kept nagging at me. But I was patient and kept watching and realized how wrong my initial impression was. I realized that the slow pacing and lack of a central purpose/goal of the early episodes actually works to improve character development so that the finale hits us that much harder. From the midpoint on Tokyo Ghoul turns into an absolute masterpiece; I began to see depth to the whole story and the shows profound take on ethics and psychology. This series has potential to become one of the best anime's in recent memory if it gets a few more seasons. In fact, I think that the plot is thick enough here to warrant many more seasons. Season 1 does a excellent job setting the context and introducing us to the characters. 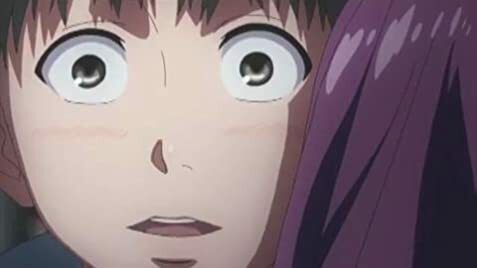 It would be a shame if Tokyo Ghoul ended after just 24 episodes. I want more than that. If you fail to reach the midpoint of the first season, you will judge this series inaccurately based on limited data. If you make it to the midpoint, however, you will have that epiphany you've been searching for and the show will appear before you in a new light, as it has to me. Don't judge this series based on the manga; they're totally different artforms and should be judged separately. It seems to me that a lot of people who negatively judge this series are extremely biased in favor of the manga, and that's just unreasonable. If judged by the first half alone: 7.0-8.0/10. If judged by the second half alone: 10/10. If judged in hindsight taking into consideration everything I mentioned: 10/10. Three light novels have been released thus far and all are written by Shin Towada, with illustrations done by series creator Sui Ishida. Face-Off: "Parasyte: The Maxim" vs. "Tokyo Ghoul"